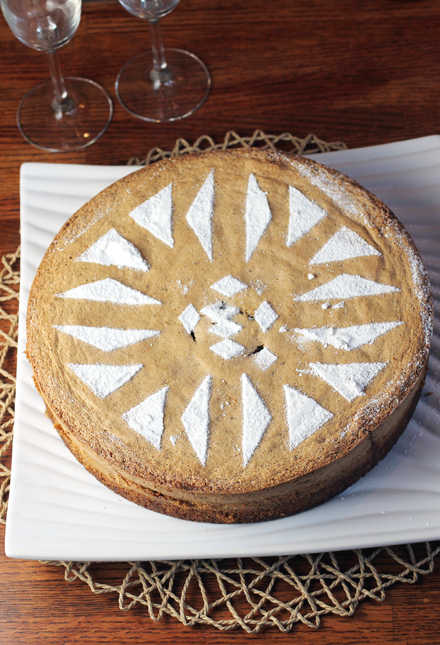 Yigit Pura’s sublime cake that’s flavored with warm spices and nuts. There’s no shame in going simple. Not even during the holidays. Take this lovely cake, for instance. 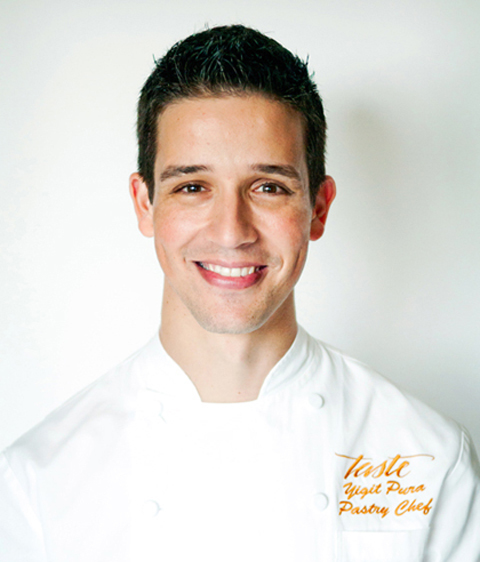 “Spiced Hazelnut-Almond Mirliton Cake” is the easiest cake recipe in San Francisco Pastry Chef Yigit Pura’s repertoire. But that doesn’t mean it’s not special. On the contrary, it’s everything you want in a cake — moist, airy and delicately fragrant. 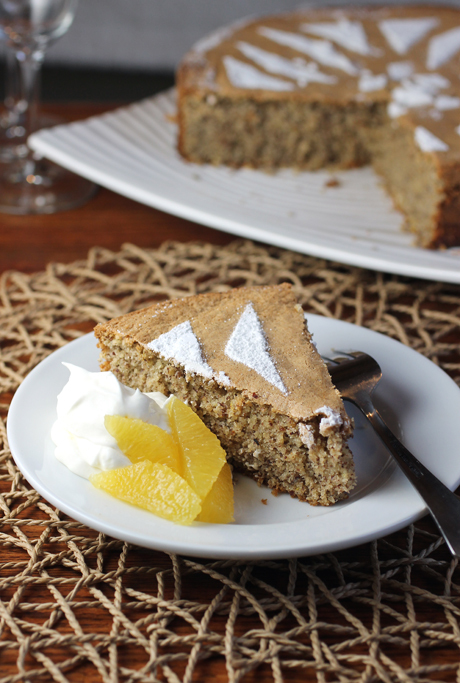 It’s a most elegant, light spice cake imbued with cinnamon, cardamom, cloves and citrus zest. It’s also gluten-free, owing to the fact that it’s made with hazelnut and almond flours, which are roasted in the oven to really bring out their wonderful nuttiness. The recipe is from Pura’s debut cookbook, “Sweet Alchemy” (Chronicle Books), of which I received a review copy. 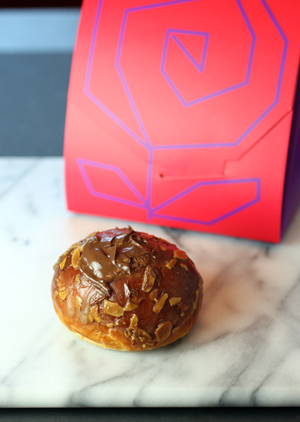 Would you believe this is gluten-free? 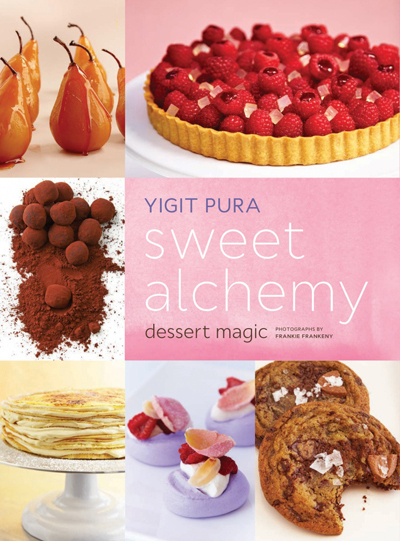 Pura, the inaugural winner of “Top Chef: Just Desserts” and the owner of San Francisco’s Tout Sweet patisserie, has created a book that builds on the fundamentals as you go along. Learn how to make Citrus-Scented Panna Cotta and Blood Orange, Grapefruit & Campari Gelee. Then combine both in a gorgeously layered Negroni Creamsicle. Learn how to make a basic Crepe Cake. Then add on Vietnamese Cinnamon Brittle, Butterscotch Sauce, Orange Flower Water Diplomat Cream and Bosc Pears Roasted in Caramel & Indian Spices to create the knock-out Layered Crepe Cake Brulee. Be patient as you make this cake because it will take quite a few minutes to whip the eggs until their volume triples and their texture takes on an almost marshmallow-y consistency. Don’t forgo placing the collar of parchment around the cake pan, either. You’ll need it, as the cake will rise slightly above the rim of the pan as it bakes. I was skeptical when the recipe said the 10-inch cake would bake in 18 minutes. Perhaps in a convection oven, which wasn’t noted. But in my conventional gas oven, it took about twice that long — about 35 minutes total. So just be sure to monitor the baking time carefully. The recipe also says to test doneness by inserting a paring knife into the center. But if you look closely at my cake, you’ll see that telltale knife marks are left behind. Perhaps better to use a cake tester or wooden skewer instead, as I’ve noted in the recipe below. 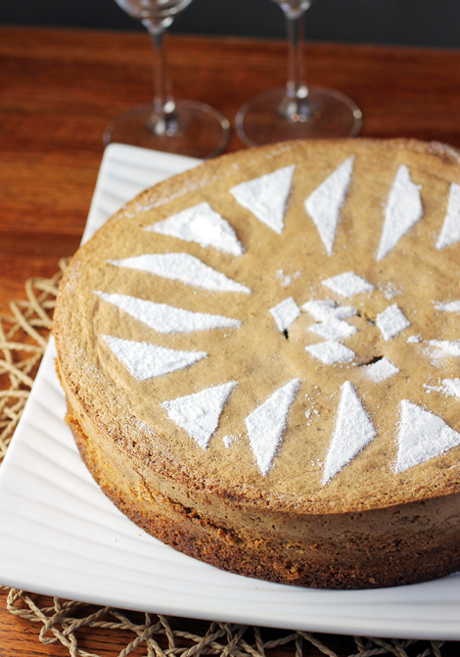 The cake is satisfying enough with just a shower of powdered sugar on top. But if you’re serving it to guests for the holidays, you might want to take Pura’s recommendation as I did to garnish slices with voluptuous whipped Mascarpone Chantilly, which amplifies the orange note in the cake even more. I even went a step further, serving the cake with fresh orange segments or supremes, which have had their rind, pith and membranes removed. This isn’t a fancy cake with an overload of flourishes. But you don’t need all that — not even at this festive time of year. One taste will convince you that simple can be a gift in and of itself. Pretty enough for the holidays and simple to make. Set the eggs out about 1 hour ahead of time to come to room temperature. Preheat oven to 350 degrees. Line a rimmed baking sheet with parchment paper and spread the hazelnut and almond flours on the parchment. Toast in the oven for 5 to 6 minutes, or until they are a light golden brown and the aromas fill the room. Let cool to room temperature. Once cool, sift the nut flours with the cornstarch, cinnamon, cardamom, and cloves into a large bowl. Coat the bottom and sides of a 10-inch round cake pan with cooking spray, cut a piece of parchment paper to fit the bottom of the pan, and press it in to line the pan. Cut a second piece of parchment paper into a strip 2 inches wide to line the inside edge of the pan and press it in to set. With the mixer on low speed, gently mix in the flour-cornstarch mixture, just until everything comes together. Take care not to deflate the batter. Gently pour the batter into the prepared cake pan. Place into the center of the oven and bake for 10 minutes or until a light golden crust forms on the top and the cake begins to visibly rise. Rotate the pan 180 degrees and bake for another 7 to 8 minutes (or as many as another 18 minutes on top of that, depending upon your oven) until the cake is golden brown and lightly bounces back to the touch. To check doneness, insert a paring knife or cake tester into the center of the cake; it should come out clean and hot to the touch. Once the cake is done, remove it from the oven and set it on a cooling rack to cool to room temperature, 15 to 20 minutes. When the cake is cool to the touch, use an offset spatula to loosen the outside of the paper lining from the pan. Invert the cake over a plate or a baking sheet and then shake to release the cake from the pan. Remove the paper lining from the cake and reinvert it onto a plate or baking sheet so that the cake is right-side up. The cake is best enjoyed immediately for the full nutty, spicy flavor. It can be prepared up to 3 days in advance and stored in an airtight container in a cool, dry place. Serve with dollops of Mascarpone Chantilly and orange segments that have the rind, pith and membrane removed, if you like. Combine all the room-temperature ingredients in a large bowl or the bowl of a stand mixer. Use a large, balloon-shaped whisk or the whisk attachment to whip the ingredients to full peak stage; do not over-whip (we’re not making butter here, folks).